You are here: Home / Make Money Online / What’s In A Domain Name? Big, Big Bucks! In July 2007, the domain name, Chinese.com, was sold by Sedo.com for over $1.1 million. During that same auction, resume.com sold for $300,00.00 and spices.com sold for $220,000.00. For the active domain investor, a simple name can yield big-time profits. Which domain names sell the best? One-word dot coms still outsell longer domain names, but most domains consisting of even two and three word combinations can sell for thousands of dollars. In a recent auction, FreeStuff.net sold for $28,000.00 and RareCars.com sold for $27,000.00. Even more outlandish names can still yield impressive and fast sales. “Long Tail Names” or domain names consisting of longer phrases are frequently available and still sell for surprisingly high dollars. 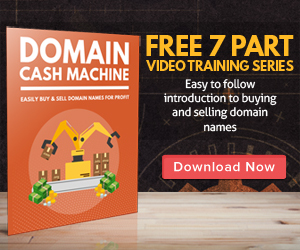 With a little good trend spotting and some common sense, it’s fairly easy to identify good domain names that will turn a good dollar. There are a variety of free online tools available to new domain name speculators. Most domain registry services offer such tools to their visitors and customers. Professional domain name investors may employ more extensive market research, statistics and expert advice to make their final purchasing decisions. How long does it take for a domain name to turn a profit? It all depends on the name itself and the current market trends. Experienced domain name investors know exactly how to pinpoint the best names, determine their value and where to sell them for top dollar. Typically, an independent domain name brokerage will act as a middleman and handle the transaction from the initial contact through the final payment for the domain. In most cases, this domain name broker will 10% to 15% for their efforts, making this fast money for both the seller and the broker. While some domain name investors have demonstrated uncanny skill and timing in scooping up and reselling domain names quickly, the average speculator may first need to build some equity in their domain name to increase its asking price. A domain’s value typically increases the longer it has been around, the more ad revenue it is generating, and the greater the amount of traffic it has flowing to it. In the long run, a name purchased for ten bucks can yield thousands. Playwright, William Shakespeare, may never have really known what was truly in a name, but for today’s domain investors, they know that a good domain name is worth its weight in gold.